Once you’ve decided to put your house on the market, there are suddenly a lot of things you have to do. With arranging valuations, talking to estate agents and sorting out photos, it’s difficult to work out if you’ve done everything properly. The one element we see people forgetting about the most is the house itself – which is odd given that it’s often their biggest asset and the thing being sold. But a little attention can add thousands to the value of your home, and for the most part all it takes is time. So this month, we wanted to give you some tips on how to prepare your home for sale. Houses that are clean, tidy and free of clutter for viewings sell quicker, and often for higher values than those that aren’t. So before you put your home on the market, get rid of all that excess stuff that has accumulated in every nook and cranny. You don’t have to throw it away – but simply pack it away and put it on storage. But there is such a thing as going too far with the decluttering, so you need to get the balance right. People need to be able to envisage what the property would look like if they were living in it, so it still needs to feel homey and not too sterile or hotel-like. There are plenty of people out there who are looking for a bit of a fixer upper, but most buyers prefer a neutral home they can move into right away without too much extra work. Giving your walls a fresh lick of neutral paint will fix any dings or imperfections in your walls that could discourage buyers, making it seem more attractive. It will also be easier for viewers to imagine how they would adapt the rooms to their needs, and it will make your home seem lighter and bigger. If you’re looking to really make a good impression, give the front door a new coat of paint too. First impressions count, and if buyers come into your hallway and already love the place, you’re already halfway to the sale. In the run up to putting your home on the market, start doing any minor repairs that you’ve been putting off for a while. Holes in the wall, broken door knobs, cracked tiles or threadbare carpets – all of these have the potential to increase the value and appeal of your home. Tidying up the garden if you have one and giving the entire house a thorough deep clean will all help boost sale speed too. Pay particular attention to high traffic areas like toilets and showers, and places that don’t get cleaned as often, like curtain poles and cobwebs. But be realistic. If you don’t know which end of the hammer is which, call in a handyman to do your DIY instead! 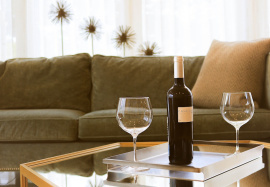 When you have viewings booked in, you should make a point of setting up the right atmosphere to make buyers feel at home the second they step in the door. Bad smells in a home are the single biggest turn off for prospective buyers, so make sure you get rid of them by fixing the source of the smell. Clear all the drains, open some windows and air the kitchen out to remove old cooking smells. Make sure bedding is all clean and remove any furniture that’s embedded with odours. If you are a smoker, a good way to neutralise the smell is to put bowls of vinegar around the house and leave them there for 3 or 4 days. Though the vinegar will smell, it will disappear very quickly when you open the windows and will take a lot of the cigarette smell with it. Once you’ve got rid of the bad smells, try and get some good smells wafting through, like freshly brewed coffee and baking bread are ok. But a little passé. A couple of Yankee Candle diffusers however will give your home a lovely fresh smell. If viewings are late or during winter, light a fire to make your home warm and inviting. Even if you only do some of these small things, you are dramatically increasing the chances your house will sell at asking price in a shorter space of time. If you’re not sure what you need to do, or how to freshen up your home, get in touch with your estate agent for some friendly tips. For example, our team at Northwood have connections in a wide network of professions, so if you don’t have the skills to fix that door hinge or the time to clean your home, we can put you in touch with someone who can help. For more information, get in touch with us today.